Preparation of Medium: Add a nice, whole chicken to a large pot. Add enough tap water to cover the chicken by about 1 in. Stud the whole, peeled onion with the three cloves. Add the onion and remain- ing ingredients to the pot. Rapidly heat and bring to boiling. Lower heat to a simmer and cook for 1 to 1.5 hr. Remove the chicken and vegeta- bles from the broth. Remove skin and bones from the chicken. Cut up the meat into 1-inch pieces. Return the meat to the broth. If desired, slice the carrot and celery and return them to the broth. Use: For the growth and nutrition of microbiologists. On a more serious note, I’ve been playing with isolating bugs from raw wort and managed to isolate something that I thought was wild Lactobacillus, but it wasn’t. Whatever it was I threw it out, thought I probably should have played more with it. In any case I still have a sample in my fridge and could just restreak it all. While doing that I was using WYeast’s Lactobacillus that I got from Brooklyn Homebrew as a control and made an observation that it doesn’t grow on agar that contains bromocresol green. I don’t know if it’s something I did, but it consistently refuses to grow on anything with that dye while it overruns the entire plate within two days on the same medium without it. I have also been playing with lactose agar hoping to fine-tune it for Lactobacillus isolation. As far as I know Brettanomyces annomalus can also metabolize lactose so it could be helpful in differentiating between some strains. New Glarus dregs are not proving to be too useful yet, but I have hopes for at least something. Anyway, I’ll keep you guys posted. Yes yes! I am still here! OK people! Sorry for being absent for such a long time, but life is just too busy to post new stuff. So… Let’s see what I’ve been up to… Surviving grad school… so far… Got a paper accepted for print in RNA Biology. Working on another manuscript, making figures, etc. Rotating in a cool lab and probably will try to stay in it if I can. After banging my head against the wall trying to isolate the bugs in that blend I finally managed to get 3 types of colonies on the plates. 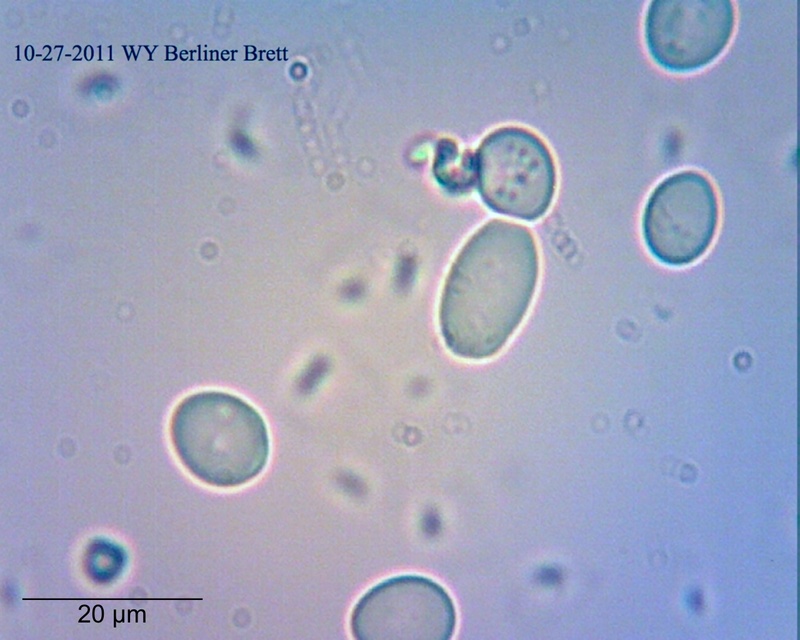 White, smooth, round colonies – probably Saccharomyces. Do not break down bromocresol green (resulting in blue-transparent colonies) nor universal indicator (in which case they are orange). No acid production. Under microscope they look like yeast. Round cells, about 5-6um in diameter. Budding visible. Beige, smooth, round colonies. 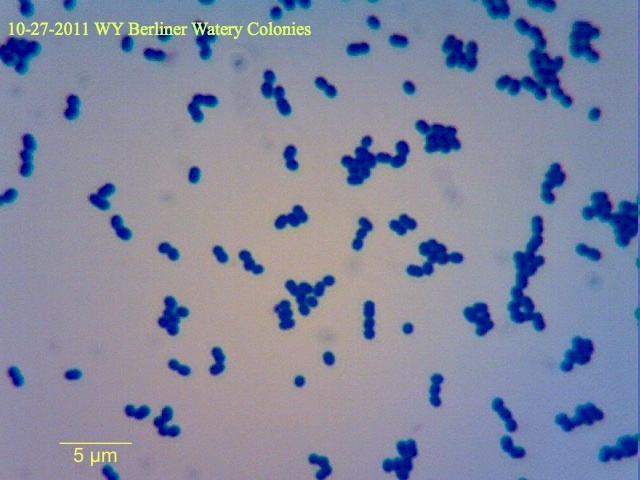 Break down bromocresol green and universal indicator resulting in white colonies. Low acid production. Under microscope they look like HUGE yeast cells. Round, tear-shaped, and rarely oblong, approx 11-17um in diameter/length. Pretty sure I saw some budding but didn’t take pictures. Seems to me like that’s the Brettanomyces spp. even though they don’t look like the traditional “brain shaped” colonies. B. annomalus perhaps? Who knows. Small to gigantic, watery, transparent, smooth colonies. Do not metabolize indicators resulting in watery colonies on every medium. Acid production. Under microscope they look like cocci in chains. Approx 0.6um in diameter. Gram +. Looks like Pediococcus or Enterococcus to me, which is weird because WY says they have Lactobacillus in that blend. No matter how much I tried, I never got any bacillus colonies. Maybe they changed it in 2011 and used Pedio instead of Lacto. Also I’m pretty sure I isolated the Brett from the Old Ale blend. I know it’s only Brett L which you can just buy, but this is more fun. Brain shaped colonies, oblong cells, nuclei visible with Meth. Blue stain. Attached are some pictures. I apologize for the quality. My camera has something on the inside which results in showing all sorts of junk that’s not really there, not to mention poor quality. What’s next? Well next I have to repeat all the isolations again because I pretty much lost everything over the last two months due to school. Also today I got a shipment of brew from my buddy Marc from WI (thank you dude!) so now I also have a bunch of beers from New Glarus to isolate bugs from as well as to enjoy. The upcoming semester should be easier and there will probably be more time for me to play with the yeast and finally try blending them. Also last week I brewed something that can probably be called an Anglo-Scandinavian Wheat-IPA-Gruit. Those of you who know me will know that when it comes to gruits and winter brews, I’m all about the juniper. GIVE ME JUNIPER!!! But in any case, it’s on the dark side, lots of wheat, smoked malt, a ton of Fuggle, juniper berries, pink peppercorns, licorice root and lavender. Sounds crazy? Sure is! Started at 1.080 and spent its first 5 days at 60F then allowed to come up to room temperature. Today I popped up the bucked lid to peek inside and other than seeing juniper berries floating around, I was hit in the face by something that I can only describe as “the best smelling beer I’ve ever made!” It smells exactly how it feels in the forrest right now – earthy, leafy, grassy, minty, evergreens, and fresh. Just amazing. Let’s wait a few weeks and see how it turns out. If it’s as good as it smells right now I’ll post the recipe here. And do post your thought and comments.